This was just in time for Ramadan and the Ascension feast. Ramadan started on May 26th and goes until June 24th while May 25th was the Catholic, Feast of Ascension day. I have already talked about these two pagan holidays in other papers. 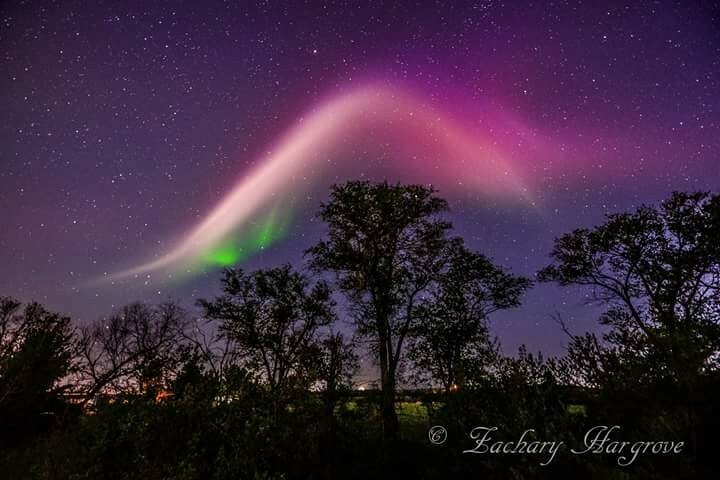 Now some might not know this but the earth started to feel the effects of a solar storm and geomagnetic storm. I’m going to be honest with you, I don’t quite understand all of the wording that these people that have been following this disturbance are saying but I do know that its gotten to be pretty intense. When I first looked at the pictures of this storm I noticed how the map shows what looks like a crescent with a smiley face….just in time for Ramadan. I find that strange since there are some scholars that associate the cresecent with Jupiter and not the moon. And with everything going on with Jupiter lately that was my first thought. 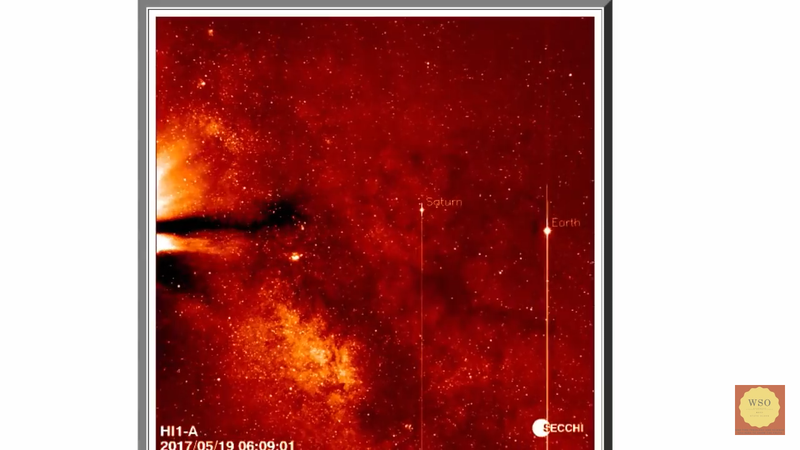 Is this disturbance/pulse that is hitting the earth associated with Jupiter or is it more solar flares from the Sun? We will get to that on a second. 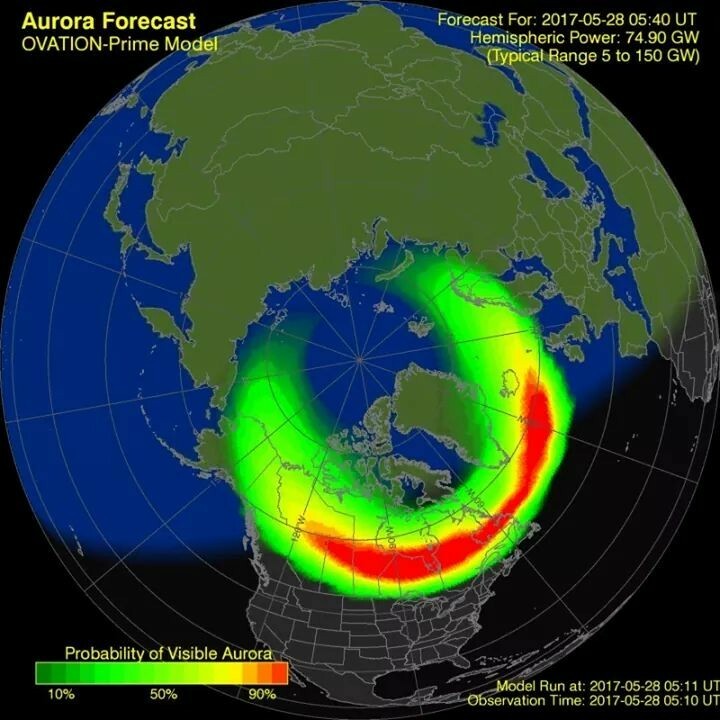 Now as soon as this news came out about this storm, people started saying that you would be able to see an aurora on the southern hemisphere. Well they were right. 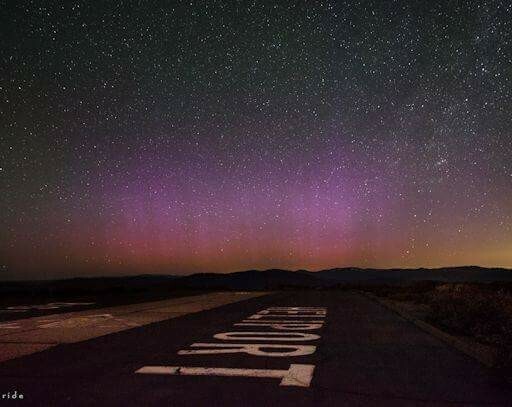 What is normally seen in the northern hemisphere is now showing up in the southern part. Now the aurora thing has got me a little tripped out after watching the Amazon show The Fortitude. In the show they have a red aurora that turns out to be a bad omen. 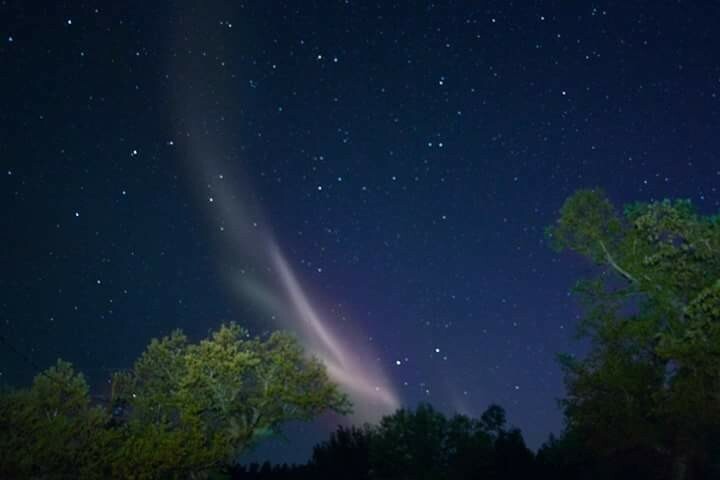 This red aurora that shows up is the sign of a demonic entity that is to enter Fortitude and it possesses a man ala Satan as the Antichrist. 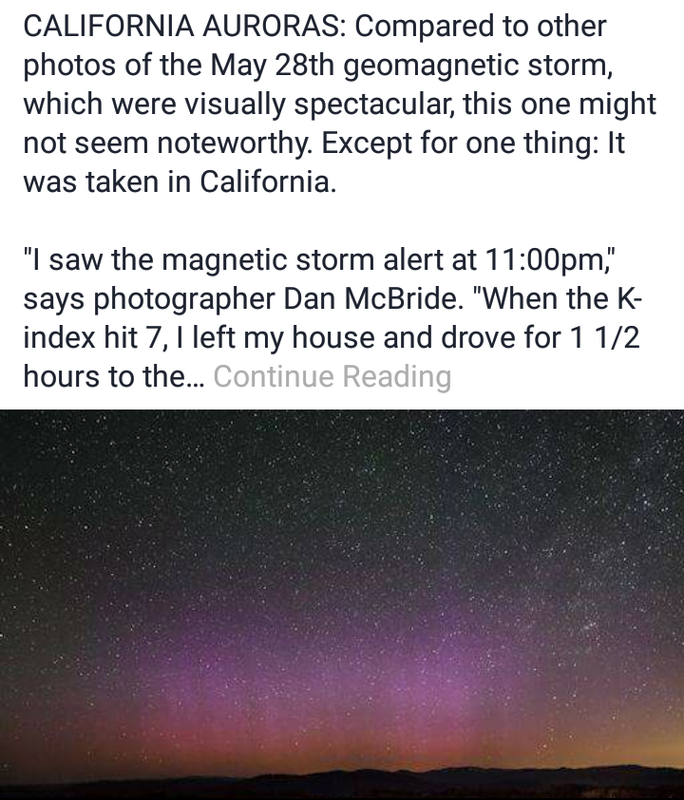 This was my first thought when seeing these auroras because its so abnormal for them showing up as far as Arizona and were seen on May 28th in California near Lake Tahoe. 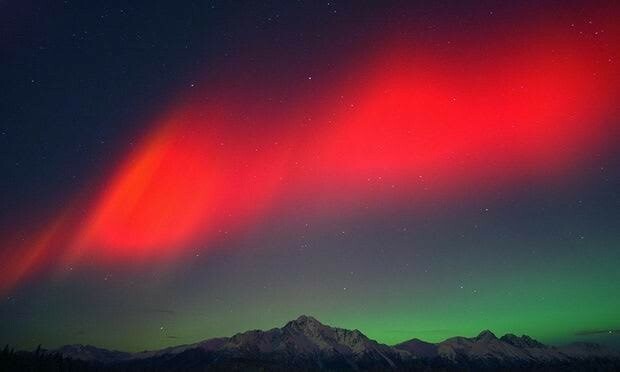 So its just not a tv show that says these red auroras are bad omens but it’s a known thing. And we know that the Sun is the biggest culpret of these auroras. 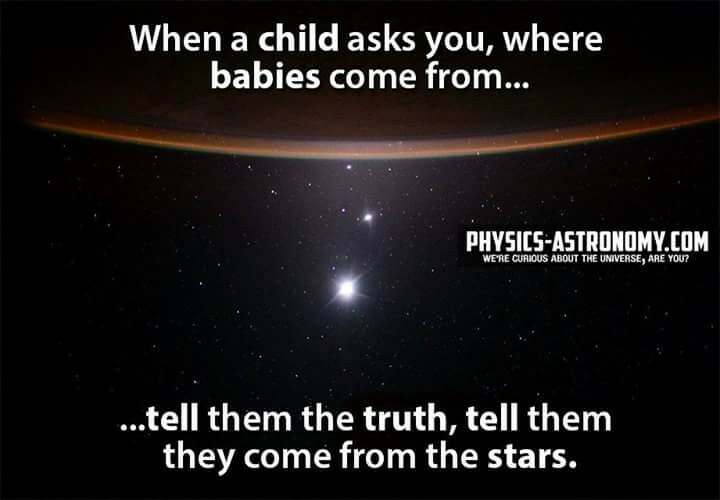 But what if an aurora was caused by say Jupiter. Could that happen? Well on this case it may. I want to point out again about all the “changes” that NASA is claiming Jupiter is going through right now. 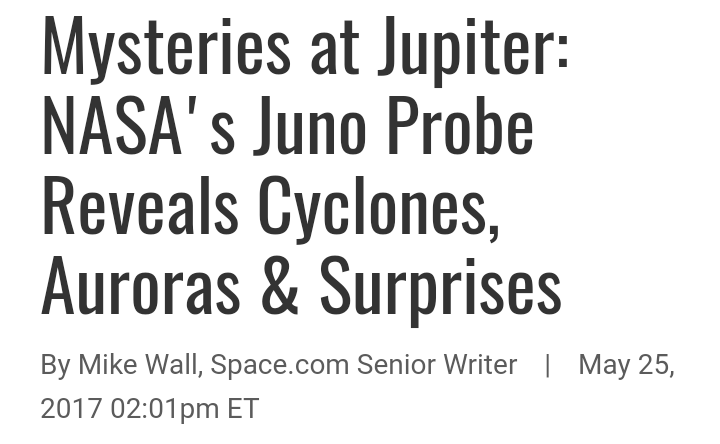 I already mentioned it in the Trappist article and now they have come out to say that There are not only auroras on Jupiter but there are cyclones and snows on Jupiter. 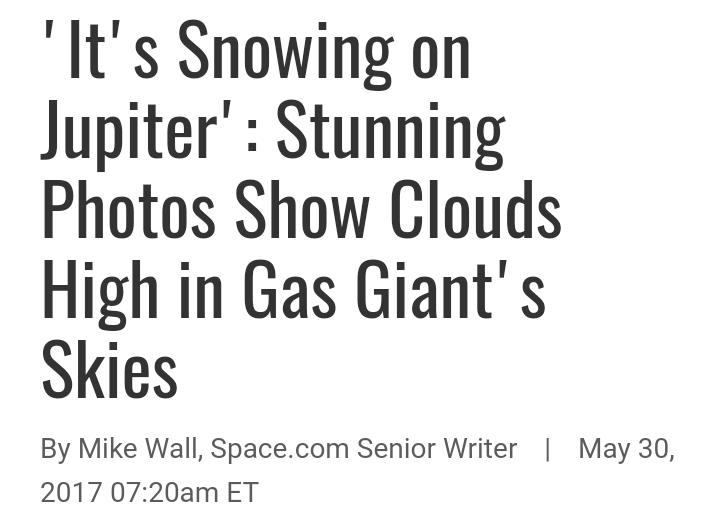 (http://www.space.com/36999-jupiter-mysteries-cyclones-auroras-juno-probe.html, http://www.space.com/37009-jupiter-snow-high-clouds-juno-photos.html?utm_content=buffer919cd&utm_medium=social&utm_source=facebook, http://www.blastr.com/2017-5-29/we-knew-jupiter-was-weird-now-were-finding-out-how-weird, http://www.physics-astronomy.com/2017/05/a-whole-new-jupiter-nasa-11-billion.html?m=1#.WS37EtllDqD & https://www.indianagazette.com/news/reg-national-world/monstrous-cyclones-churn-over-jupiters-poles,26399524/). They are calling these new revelations of Jupiter a “lifting of the veil”. What a play on words right? Oh and don’t let me forget that one of the new pictures of Jupiter looks like a turtle or a frog. I’m actually serious. That’s what people have said it looks like. Now a month ago I wrote about the nation wide power outages and speculated if these were related to a EMP from these storms. I suspectrd it was associated with Saturn or Jupiter, but in this case I think it may be Jupiter. Here are a few videos regarding these outages in the United States that even affected airlines. Now lets talk about Jupiter for a second. 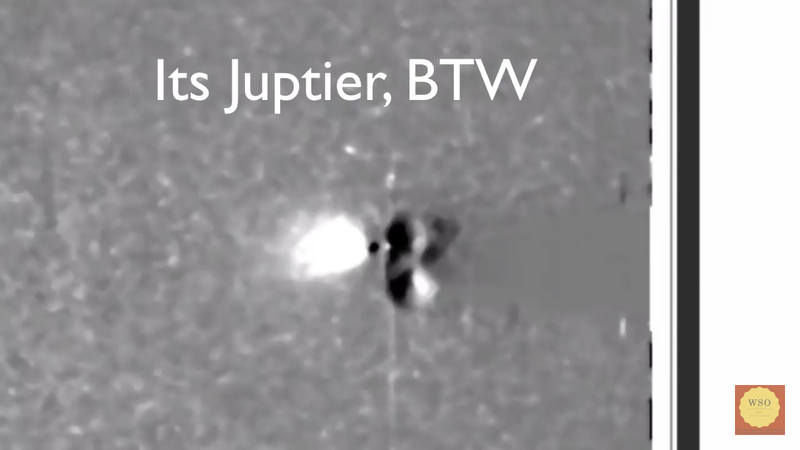 I’ve wrote papers about Jupiter sending these storms that can cause EMP’s on the earth that could be connected to portals (https://hiddeninthecrag.wordpress.com/2017/03/26/57775778-timeline-an-overview/). In the paper I just did, I have you a excerpt from the book “When Worlds Collide”, I mention the comet connections to Jupiter and the deluge. Now God destroyed the earth the first time with water and He promised He would never do it again with water. His promise was a rainbow in the sky. 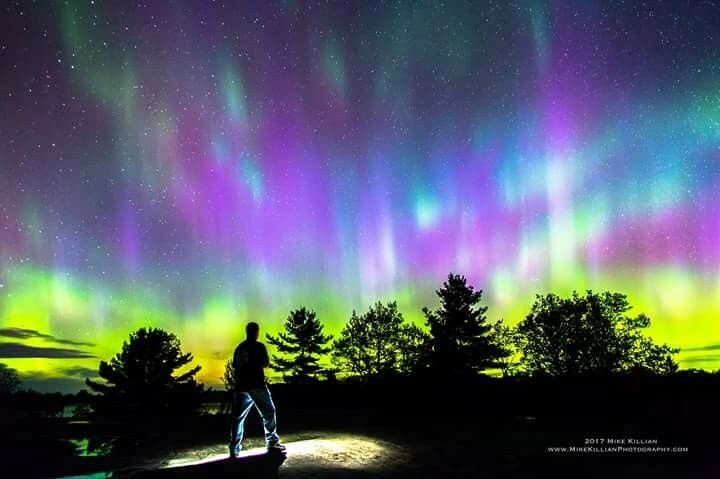 It’s strange that auroras have a “rainbow” effect with the different colors. He told us that the earth would be destroyed for the final time with fire.This brings me back to the red aurora omens. 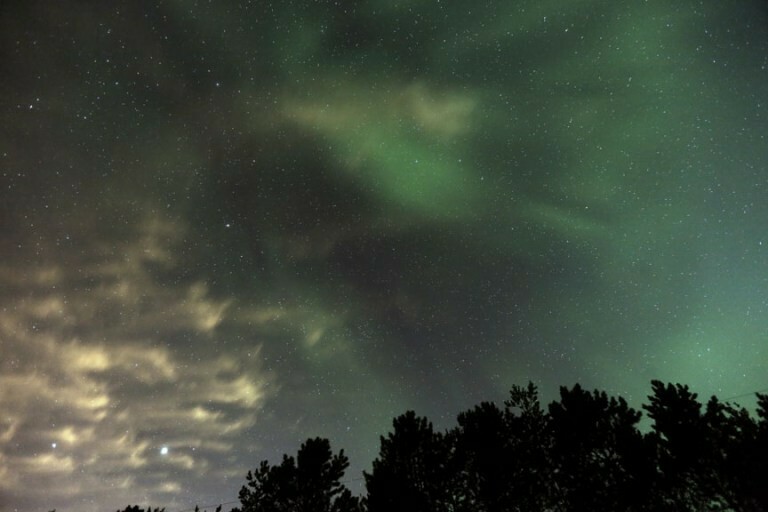 Joel 2:31 says “The sun shall be turned into darkness, and the moon into blood, before the great and the terrible day of the LORD come.” Is God trying to show us something with these auroras showing up the way they are in places that they have never been. Is this an omen that something or someone bad is coming over the horizon? I can only speculate but there are a lot of factors that are coming into play here. Now lets get back to the comet and Jupiter. But before that let me say that some of these auroras the last few days (5/28-29/17) have been seen in the South. That’s interesting because right now Jupiter is in Virgo in the South about 120 days out from the May 26th date. Jupiter is in its final trimester getting ready to be “birthed”. Now being that Jupiter is in the South in Virgo, there will be a comet passing through Virgo from now (end of May) to mid-June. 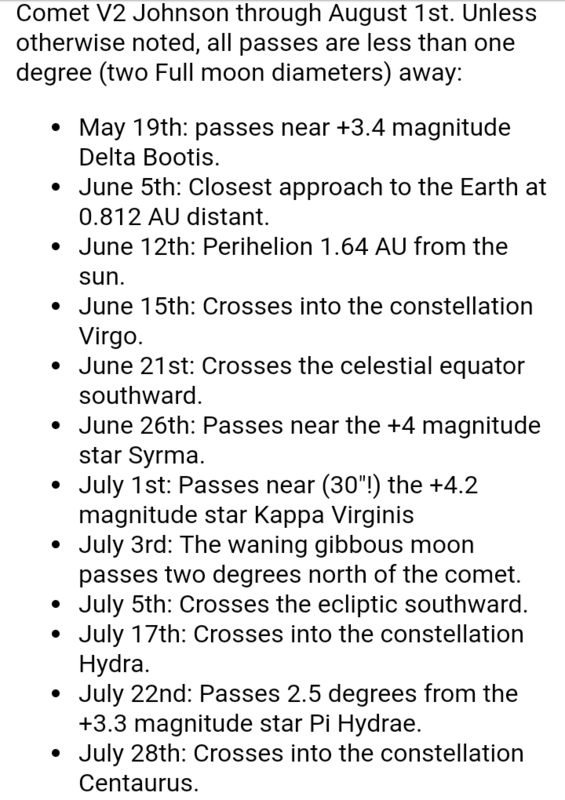 Some have said it crosses into Virgo in July. This comet is called Comet Johnson. 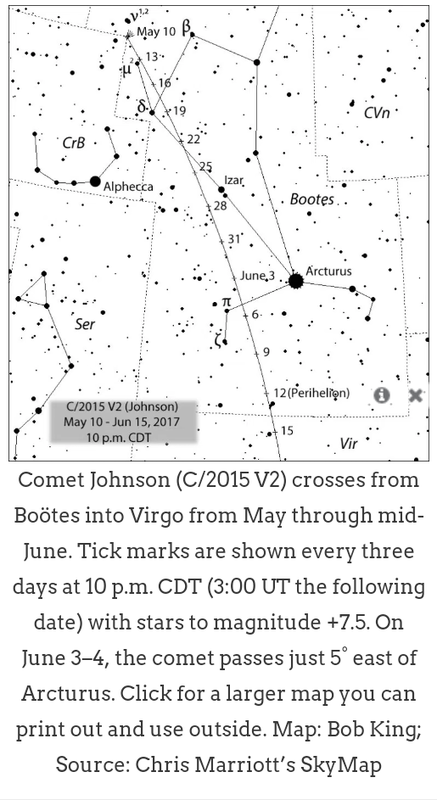 “Comet C/2015 V2 Johnson has been sliding south down the side of Boötes the Herdsman all month and slowly brightening. The “2015” in its name was the year of its discovery. On Nov. 3, 2015, astronomer J.A. 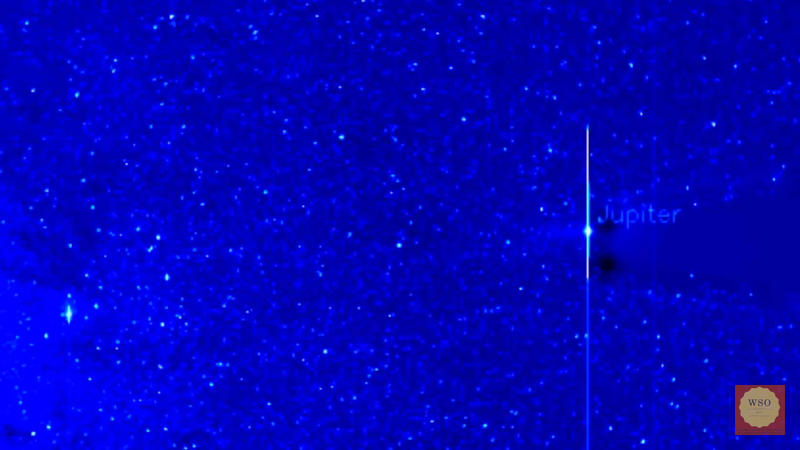 Johnson, working with the Catalina Sky Survey, found the then-faint new comet in the constellation Lynx the Lynx not far from the bowl of the Big Dipper.” (http://astrobob.areavoices.com/2017/05/29/earth-crosses-comet-johnson-orbit-tails-twist/). I just can’t get over how everything seems to be connected whenever Jupiter is mentioned in light of what’s coming in the near future. And its just not the comet that is going on. 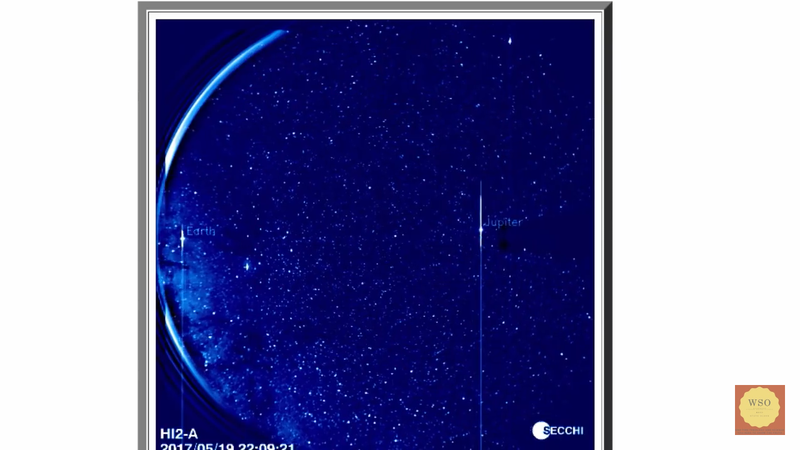 Something was seen either hitting Jupiter or leaving Jupiter on May 26th, 2017. This actually happened in March of 2016 too. 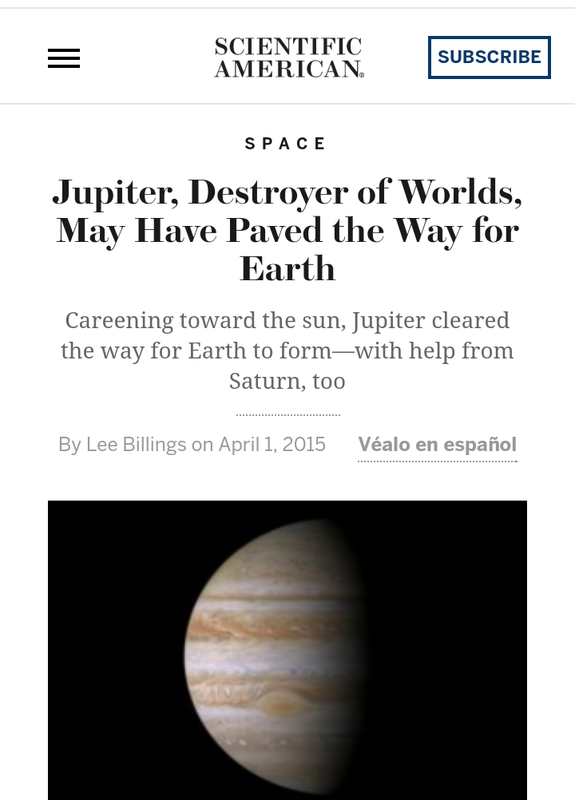 But they say something had actually hit Jupiter. 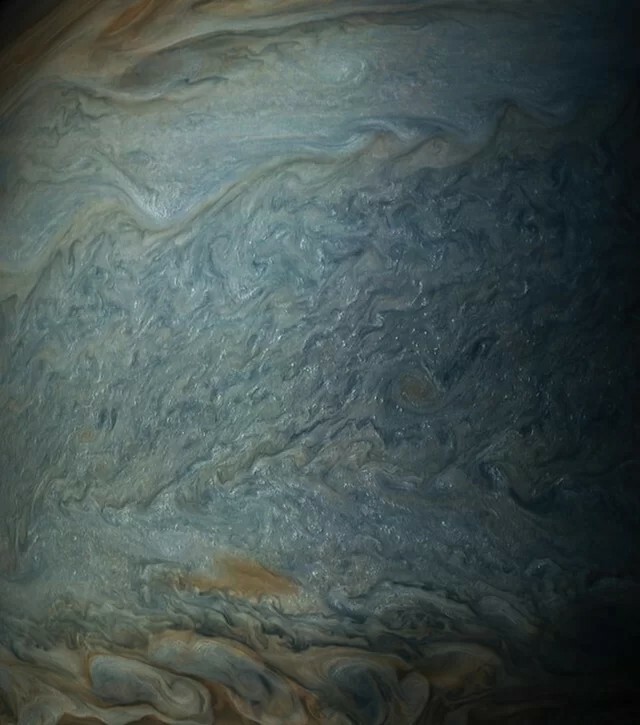 This time around it looks like something is leaving Jupiter. I’m telling you, the timing of all of this info is suspicious. Either it is really happening or its not and its all symbolic for something that will happen in the natural. I can’t make heads or tails of it. But I do know its all related to the “birthing” of Jupiter on 9/9/17 and the false sign of 9/23/17. I just want to add one more thing before we are finished here. 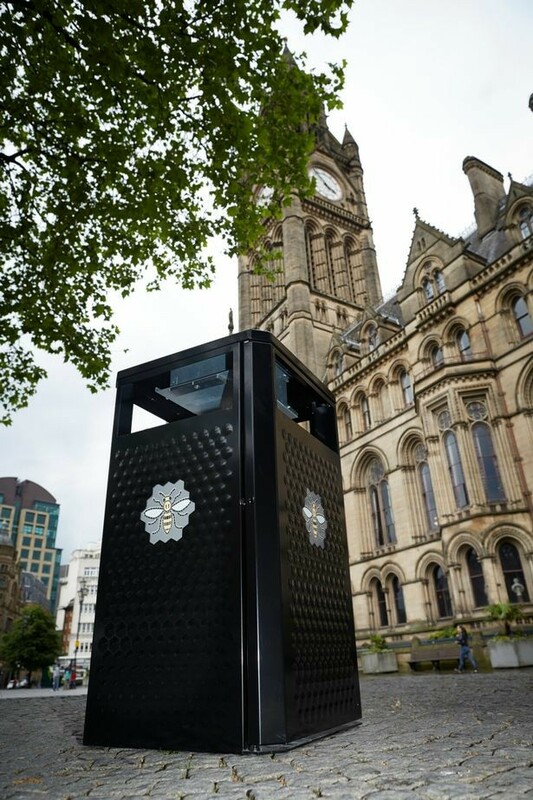 On May 22nd there was a bombing at a Ariana Grande concert in Manchester. I’m not going to get into whether its a false flag or a real event from the hands of Daesh or should I really say ISIS. You can go to countless videos and decide for yourself. I want to talk about the memorial that people are doing for this event. They are getting bees tattooed on themselves as a memorial. 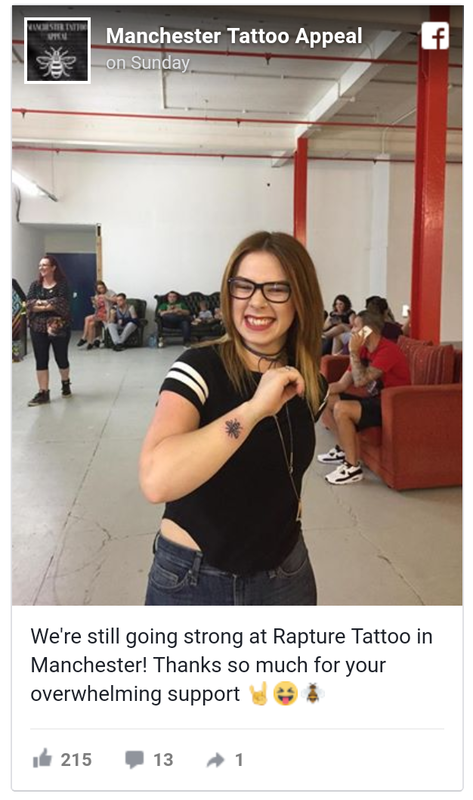 The irony of “Rapture” tattoos along with everything else going on. The bee represents the hive mind. Something that is made to center its life on supporting the queen bee. We as humans are known as the bees who support the hive according to these elites. They want us to think the same, eat the same, speak the same, buy the same..get my point? In my new book I mention how the bees are connected to the mythos of the Osiris Apis bull. These bees are born out of the dead body of the Apis. You can say that these bees are the survivors of this dead Apis that was regarded as a representative of a “god”. In this case its Osiris. I see this as the rebirthed image of this beast, oops I meant bull. 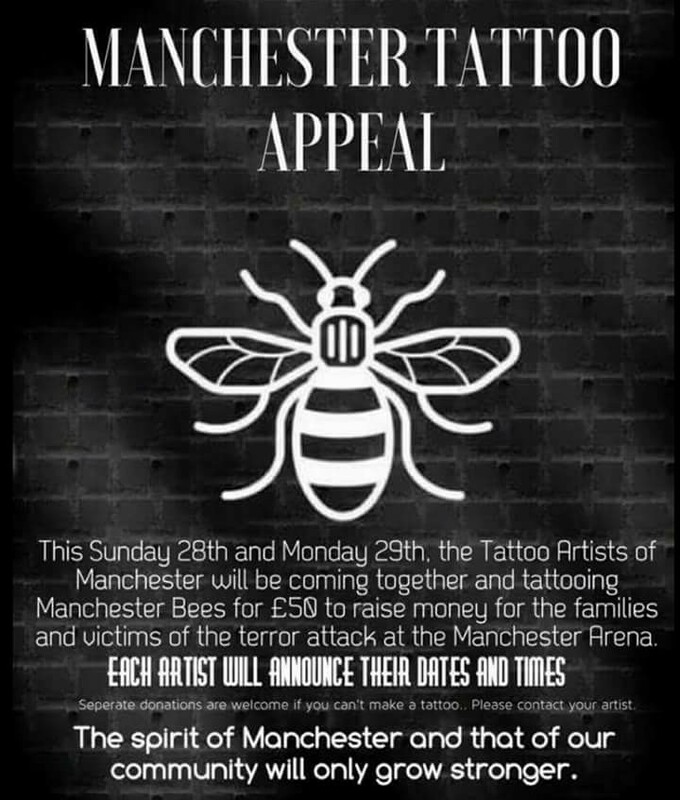 Now I find it ironic that all these people in Manchester have chose to get bee tattoos and mark themselves to stand against “ISIS”. 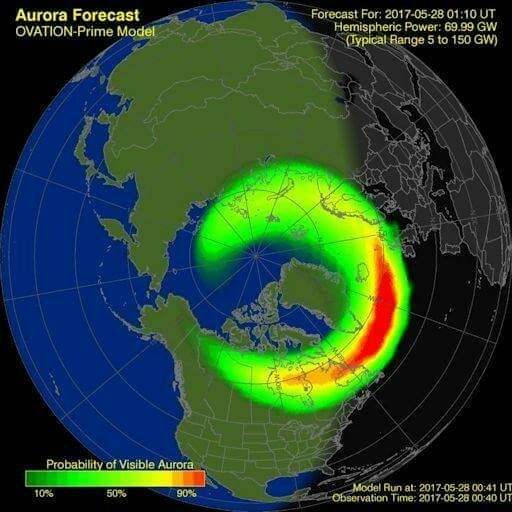 This Manchester event happened right before this solar storm started. Are they connected? 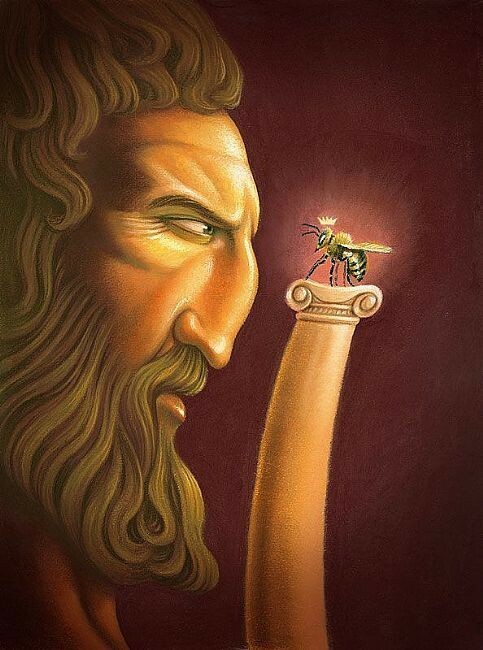 I don’t know but I do find it it interesting that bees are connected to the Apis/Osiris bull and Jupiter.